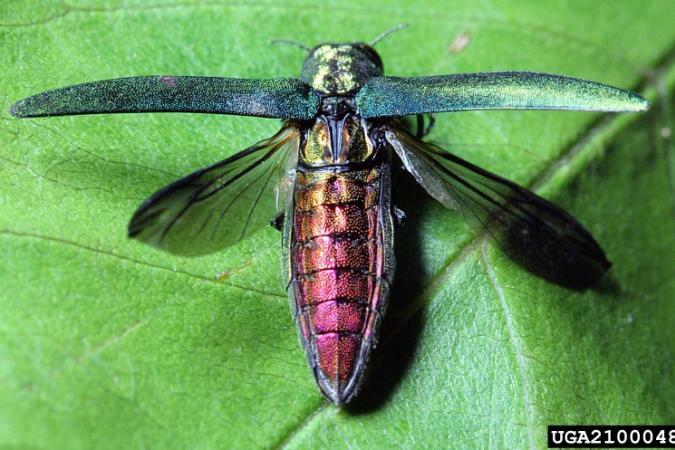 Earlier this summer, the first Emerald Ash Borers were found in Vermont. Within a few weeks, several other locations in the state were confirmed to have this invasive insect pest. Its arrival wasn’t much of a surprise. Neighboring states and Canadian provinces have been coping with EAB for several years now so it was very likely that EAB would reach us. Still, the news was sad for those of us who have large beautiful ash trees on their property. a good first look at recommendations can be found on this factsheet put out by VT Forest Parks and Recreation (FPR). VT Invasives is Vermont’s premier source of information about all invasive species. You’ll find images, maps of EAB locations, quarantine information and much more. Vermont Urban and Community Forestry (VUCF)is a partnership between ANR and UVM Extension. It provides community-based information to help guide response and management of EAB. Your town may already have begun to plan for EAB. Check your local websites for information. Unless your property is very near to locations where the presence of EAB has been confirmed, it may be quite some time before your trees are affected. Under its own power, EAB spreads 1 – 2 miles per year. So what should you do? DON’T MOVE (FIRE)WOOD – like all of us, EAB can travel much farther and faster by vehicle. Moving wood or wood debris from areas with known EAB infestations will spread this pest much more quickly than it would naturally. The very first step you can take to protect your trees is to purchase and use local wood for campfires and mulch. If you are in an EAB-infested area, check the VUCF website above for suggestions on using downed wood. Take time to plan. EAB spreads slowly and affected trees don’t die immediately. You have time to consider your options and decide what makes sense for you. Experience in other states has shown that cutting down all the ash trees near an affected area doesn’t stop the spread of EAB so that is not a step you need to immediately take. Plant new trees. The space left after a tree dies or is removed will fill quickly with new growth. That’s the natural cycle in woodlands. You can plant a new native tree or wait to see what comes up. Do keep an eye out for invasive plants because they love these newly opened spaces. Remember your lake shore forest is important for the health of your lake. Tree removal in the protected shoreland zone may require a permit. Dying and dead trees provide homes and food for many species of wildlife, both on the ground and in the water. Leaving them can be an option if they don’t cause a hazard to people or property.